Editor’s note: This post, which was referenced during the 2014 API Conference, was originally published as part of the 2013 AP Month. It carries an always-timely message for parents seeking alternatives to spanking, time-out and other punishment-based discipline techniques. Coverage of the conference continues all October during the 2014 AP Month, during which we also welcome your submissions to the 2014 AP Month Blogging event. If you have read about the benefits of skipping spanking and time-out in favor of other ways to guide children but are not sure where to start, here are 12 alternatives that give parents and children a chance to address choices and situations with the intention to offer guidance while maintaining a positive, respectful and peaceful connection. Take a break together — The key is to do this together and before things get out of hand. So if your child is having a difficult time or making unsafe choices like hitting a playmate, find a quiet space to take a break together. Just five minutes of connection, listening to what your child is feeling and talking about more appropriate choices really helps. This is similar to a time-in. Problem-solve together — If there is a problem and your child is acting out of frustration, giving him a chance to talk about the problem and listening to a solution he has can turn things around for the better. Read a story — Another great way to help children understand how to make better choices is by reading stories with characters that are making mistakes, having big feelings or needing help to make better choices. Also, reading together can be a really positive way to reconnect and direct our attention to our child. Give two choices — Let’s say your child is doing something completely unacceptable. Provide her with two alternatives that are safe, respectful and acceptable, and let her choose what she will do from there. By receiving two choices, the child can keep some control over her decisions while still learning about boundaries. Listen to a song — Sometimes taking a fun break to release some tension and connect is all that children need to return to making better choices and all that parents need to loosen up a bit and let go of some stress. Listen to a song or take a dance break! Breathe — A big, deep breath for both parents and children can really help us calm down and look at what is going on with a new perspective. Take a big “lion” breath to get out frustrations or short and quick “bunny” breaths to feel calm and re-energized. Draw a picture — A wonderful way for children to talk about mistakes is to make a picture of what they did or could have done differently. It’s a low-key way to open a window for talking to each other about making better choices. Create a chill-out space — For a time-out to work, it needs to be something that helps everyone calm down, not something that makes children frightened or scared. A chill-out space is an area where children can go sit and think, tinker with some quiet toys, and have some space alone until they feel ready to talk or return to being with others. Using the chill-out space should be offered as a choice and not a command. Editor’s note: Many parents, especially when moving away from spanking, can have a difficult time viewing discipline in terms of not punishing but rather teaching. It can take a great leap of faith that positive, non-punitive discipline can work — and work really well! It’s important for parents just getting started with positive discipline to realize that the motivation behind spanking (to punish) and positive discipline (to teach) are very different, even if they have the same intended result. Learn more about the differences through API’s principle to Practice Positive Discipline. It may help to think of spanking as a way to get the child’s immediate attention and to begin by substituting another behavior, such as clapping, for spanking to get the child’s attention before doing the positive discipline exercise. Ideas like this can help redirect your physical reflex. When getting started with positive discipline, especially if you are just beginning to move away from spanking, it can be helpful to imagine various scenarios ahead of time and how you could react to them in using positive discipline versus spanking. For example, before entering a room where your child is supposed to be drawing with crayons on paper, you could imagine finding your child drawing on the wall and run through ideas in your mind of how you could react in a way other than reflexively spanking. It’s important for your child to know that drawing on the wall is not OK by firmly saying so, but then follow up with a positive discipline technique such as problem-solving. Of course, it’s not always possible to be proactive. When anger catches you off-guard, try to take a break yourself. Apologies for our behavior, as parents, can go a long way to heal relationships with our children while also modeling what we’d like to see in our children. It can also help to understand that positive discipline works best when the parent and child have a secure attachment. If your child seems to ignore your attempts at non-punitive discipline, continue trying it out while simultaneously improving your connection. 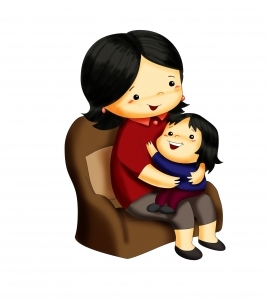 Find ideas through API’s Eight Principles of Parenting. Keep in mind, if you’re trying to shift away from spanking, you’re not the first person to do it — even API’s cofounders struggled with learning how to discipline without spanking at first. You can find support through local API Support Groups, the API Warmline or the API Neighborhood online forums.